But we did meet this critter. Very cute. ← Previous Previous post: How many people watched the fireworks in different cities? Fantastic! I went snorkelling in that area yesterday and only found a rusted car number plate. 32 degrees at midnight. God I hate that sort of weather. There is no reprise. That was lucky. You look to be quite close. @Andrew, yeah it was pretty close, perhaps 4 metres, but got nervous and jumped back in the water when we cautiously tried to move a little closer. Seemed to be having a merry old time swimming about, though it was the only one we saw. @Daniel. Heat and lack of sleep sending me mad! That’s gorgeous! 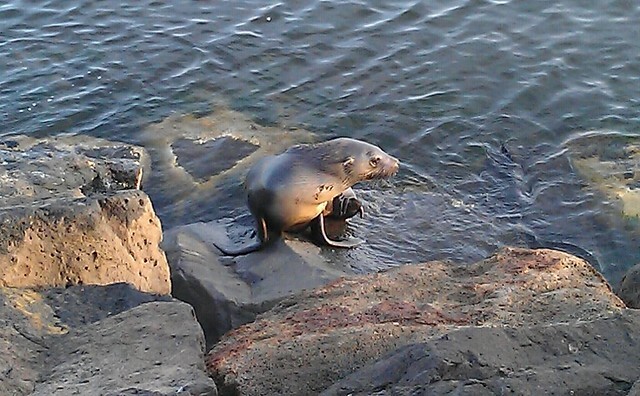 fancy seeing a seal at Brighton Beach!